There has been long debate between Muslims and Christians and even it still continues over Jesus Christ (Peace be upon him, (PBUH), his mission, his birth, his teachings and his so-called crucifixion. If the Bible itself be studied minutely, the fact will be known that the beliefs, teachings, rituals and tenets which Christians spread all over the world, contradict fully what Jesus Christ (PBUH) taught the people in the New Testament .Interestingly, Christians claim about themselves to be the followers of Jesus Christ and blame Muslims for not believing in him while in reality the Christians are far away from the real instructions and dogmas preached by Jesus Christ. In this article, we shall discuss who the real followers of Jesus are, Christians or Muslims. 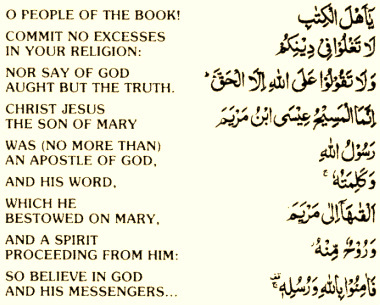 All Muslims have the faith that Jesus was a Prophet and a Messenger of Allah Almighty. In this world, the purpose of his advent was to guide the strayed mankind toward the right path. He kept preaching the people and telling them for worshipping only One God, acting upon His commandments and being kind to one and all. On the other hand, Christians have put this belief aside and considered him as Son of God or God which is totally untrue. It is the faith of Muslims that Jesus Christ was not sent by Allah Almighty to establish a new religion but to renew the religion brought by the prophet Moses (PBUH). He preached the mosaic teachings, acted upon them and ordered the people to do the same. Jesus Christ himself unveils this reality in a clear cut way. See, how clearly Jesus Christ denies having come with a new religion but with the law introduced before and that is Mosaic Law. This statement of Jesus plainly makes the base of Christians null and void who have established a new religion after Jesus Christ. They, instead of founding the new religion, making up fabricated beliefs, and spreading the unsaid things of Jesus, should have stuck to the true teachings brought by Jesus. In those days, Scribes and Pharisees were two Jewish groups who used to explain the Law and were responsible for religious matters. This statement also reiterated that Jesus did try to carry out the Law, commanded his disciples for this too. In this view point, Christians are wrong to make separate religion from Judaism. Surely, they have derailed from the right track shown by Jesus Christ and that was to observe and follow the Law. The Gospel is full of incidents which illustrate that Jesus was not a God but a God’s slave who was unable to know happening occurring around him. Once, a woman touched Jesus’ garments in a crowded place and he could not know who it was. So he said furiously who touched my clothes (Mark 05, 27 to 30). On a day, Jesus was feeling hungry like other human beings, he wanted to have something, he saw a fig tree in a far off place. On the expectation to eat fruits but unfortunately the tree had no fruit, he walke and cursed it. (Mark 11,12,13). Once upon a time, the mother of Zebedees children with her sons with her sons and requested him to grant her sons sit, one on his right hand and the other one on the left, in your kingdom but he voices obviously his helplessness and says: “You will indeed drink my cup, but to sit on my right hand and on my left is not mine to give, but it shall be given to those for whom it is prepared by my Father” (Mathew, 20:20 to 23). These quotations from the Gospel evidently nullify the doctrine of Christians that Jesus was a God. They have distorted the Gospel revealed to Jesus from Allah Almighty, altered the cherished message of Jesus Christ and misrepresented the Bible. Pitifully, they, in place of believing in Unity of God sermonized by Jesus and worshipping Him lone, regarded Jesus himself a God, adopted new ideology and groundless dogma befooling the people. Christian history itself tells that it was done with great conspiracy. On the contrary to this open fact, Christians proclaim that Jesus is the Son of God. It is exceedingly an unwise and irrational speech to declare that Jesus Christ is or was Son of God. It is nothing but a big trick which Christians play with their own Sacred Book i.e. the Bible. Any one studying the Gospel with calmness of mind will certainly come to know that Christians have nothing to do with the teachings of Jesus Christ. They do on their choice whatever they want. Their dogmas absolutely go against the teachings of Jesus. No where in the Gospel any saying of Jesus is found in support of the prevailing canons of Christians as namely some of their cannons or dogmas were annulled in light of the Gospel itself. Justly, it is Muslims who follow Jesus Christ, believe him to be Prophet, a slave of Allah Almighty, the son of Mary, having being risen up to the Sky. He will come down again on the earth before the Day of Judgment and will kill Anis-Christ (Dajjal) as a leader of Muslims. So the true followers of Jesus are Muslims not Christians.